Backyard Poultry Forum • View topic - 20 mins to make an incubator. 20 mins to make an incubator. Post subject: 20 mins to make an incubator. The beauty of this incubator is you don't need to muck around with 240V wiring. 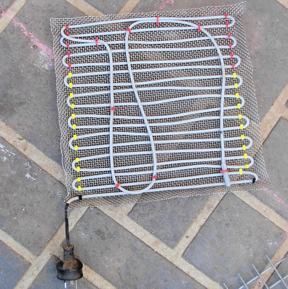 The reptile heating cord simply plugs straight into a thermostat. In the past I think the two main reasons people don't make incubators is the safety/technical aspect and the fact it seems like too much hard work. Teeni has enlightened us as to how to just about anyone can make an incubator safely without any technical know how. I thought I'd show you how to do it the easy way. I happened to have a 6m reptile heating cord in the shed doing nothing. Because the missus is never going to allow us to keep any 6m reptiles, I decided to put it to use in this project. This is it, 2 years ago I attached it to a wire mesh grid to make it into an element. I used it briefly in a large tupperware broody/hospital box. If I was putting it together today I would use any old wire mesh. Even chicken wire would do. Now for a box to put it in. I couldn't be bothered building one to be honest. There is a guy at our local Sunday market who makes pine boxes for Spuds and Onions. I think from memory they are about $45. So this morning I decided to go up and buy one. Unfortunately for him when I got to the market another stall holder had an old one for sale for $10. So I bought that. Here it is. At first glance there is too many holes. I wasn't too fussed as I knew I could easily cover the holes with whatever I was going to use as shelf supports. This is where my luck held up. Notice that the element grid is a perfect fit. That's another win for me because it means I didn't have to redo the element on another piece of mesh. Notice the white strips I have used to cover the holes. They are actually my shelf supports. Normally I would expect to use pieces of timber like 38x19mm pine or similar. But as luck would have it I realised that a hatching basket within arms reach fit perfectly and I only needed about 3mm to hold the baskets. This incubator will have 3 baskets the same. This will give me 3 levels. It has to be baskets for this one as I won't have access to lower shelves unless there is a really quick and easy way to lift the higher shelves out of the way. 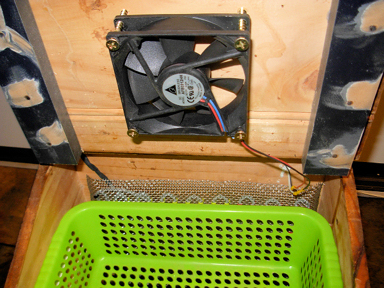 Anyway here's the top basket in place and the 12V fan screwed in place on the lid. Having the fan on the lid means the missus can use it as a hair dryer and I can use her Remington one on another project I have in mind. I have kept the drawer as is for the mean time but that might change. 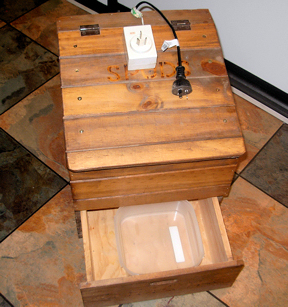 Still a few holes that need to be covered, but I could use duct tape, plug it into a thermostat and be incubating. 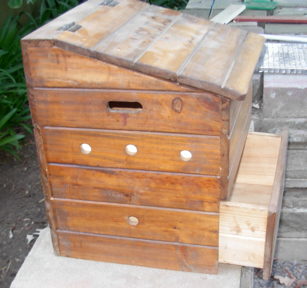 Just about any timber box you see would make a great incubator, so keep your eye out. The time taken for me to do this was about 20 mins but it was one of those days where everything rolled my way. My luck ran out of course when the missus saw it. I've been advised we need one of these boxes for the pantry much more than we need a sixth incubator around the house. Post subject: Re: 20 mins to make an incubator. thats a good idea how much is the cord worth? Is the thermostat built into the heating cord, or do you plug into an external one? where did you get the heat cord from?? i know of a place called Herpshop in VIC that sells them, is that where you got it from? Too easy Denis, now you just have to test it. I used a 4m heat cord from a reptile shop, it cost $15.00 I wove it through a fridge shelf. It heats up very very quickly and gives all over consistent heat rather than having hot spots. Plus its water proof and doesn't catch on fire. I chose a heat cord for these reasons, plus I was sure if i tried to wire in a light I would kill myslef. I just drilled a little hole in my box and threaded the cable through. It plugs straight into the outlet of my thermostat. As for it working, I currently have 38/44 eggs developing, now at day 10. I could easily fit 5 dozen in my bator, and a 4m cord heats it up to temp in about 20 minutes. Hi Denis, do you have it running and are you logging it aat all on graph. I am interested to see what its ho low swing is like. Teeni what reptile store is that was it in Newcastle? Hi Denis, I am about to build my first incubator and I like your ideas, especially buying the heat cord and thermostat off ebay! 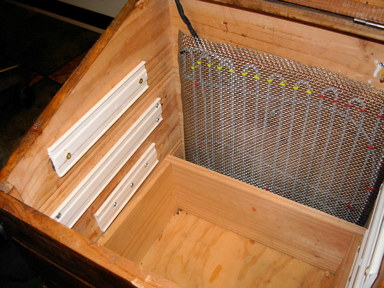 I just happen to have a wooden box very similar to yours and I am wondering if I need to insulate it as I notice that you havn't got any insulation. I have a polystyrene box which fits neatly inside the box, but is it necessary? I am also wondering about where is the best place for the water (near the fan or the heat) and what size water container would be best. Light sussex and leghorn cross, koolies, kelpies and horses. I will but in and say that you dont need any insulation at ll with a wood box. I used a large baking dish at the bottom of my box, with a few strips of chux looped up onto the heating rack above, this maintains the humidity at approx 60%. I have a fan in the lid of mine so the hot air is forced down the sides of the box and over the water before rising again. In regards to heat swings, I have a temp logger in mine. I will post the graph once I have the hatching stats. But generally it sits between 37.5 and 37.9, mostly at the 37.6- 37.8 mark, which I can live with (except when I open it to turn the eggs) It seems to be quite stable because the heat cables heat up very quickly from when the thermostat switches them on. Also they have a larger surface area than bulbs so you get a faster heat transfer. There are lots of online stores that sell reptile supplies very cheap. Just google "reptile supplies" and you'll get about a thousand hits. Some stores even offer free postage. I haven't used insulation as it seems to insulate itself but I suppose it would depend on the material used to build the box. I have used laminated MDF so it insulates quite well. I was having trouble with the lid sealing properly so I got a bit of scrap foam weather strip from clark rubber and now it seals nicely, but smells awful, I hate that rubber smell. Also, in regards to ventilation, I installed to "vents" in the lid of my bator, I used those plastic doovies that go in desks to keep computer cables tidy, they cost $2 from bunnings, and look very tidy.